In the Season Four premiere, Ross and Rachel briefly reconcile after Ross pretends to read a long letter that Rachel wrote for him. However, Ross continues to insist that the two were on a break when he slept with Chloe, so they break up again. Joey dates Kathy (Paget Brewster), a girl that Chandler has a crush on. Kathy and Chandler later kiss, which causes drama between Chandler and Joey. Joey only forgives Chandler after Chandler spends a day in a box as punishment. Phoebe becomes a surrogate mother for her brother and his wife Alice (Debra Jo Rupp). Monica and Rachel are forced to switch apartments with Joey and Chandler after losing a bet during a quiz game, but manage to switch back by bribing them with Knicks season tickets and a one-minute kiss (off-screen) between Rachel and Monica. Ross begins dating an English woman named Emily (Helen Baxendale), and the season finale features their wedding in London. Chandler and Monica sleep together, and Rachel decides to attend Ross and Emily's wedding. While saying his vows, Ross says Rachel's name at the altar, shocking his bride and the guests. The tenth season brings several long-running storylines to a close. Charlie breaks up with Ross to get back together with her ex-boyfriend. Joey and Rachel try to contend with Ross's feelings about their relationship and decide it would be best to remain friends. Phoebe and Mike get married mid-season outside the Central Perk coffee house. Monica and Chandler apply to adopt a child and are chosen by Erica (Anna Faris). In the series finale, Erica gives birth to fraternal twins, to Monica and Chandler's surprise. Monica and Chandler prepare to move to the suburbs. Joey becomes upset with the changes in his life. Rachel gets fired from her job and accepts a new job offer in Paris. Ross tries to get Rachel her job back by secretly meeting with her boss but eventually gives up after realizing that the Paris job is her dream job. Rachel says a tearful goodbye to everyone but Ross. A hurt and angry Ross confronts Rachel, and they end up sleeping together. Rachel leaves, and Ross—who now realizes he is in love with her—chases her to the airport. When he reaches her, Rachel realizes she loves him too, and cancels her flight to Paris. The series ends with all the friends, plus Monica and Chandler's new babies, leaving the apartment together for a final cup of coffee. Chandler makes a final joke. The show ends first with a shot of the keys to Monica and Chandler's apartment, on the counter table, and then with a shot of the apartment's purple door. —  The original treatment used by Crane, Kauffman and Bright to pitch the series to NBC. Each summer, the producers would outline the storylines for the subsequent season. Before an episode went into production, Kauffman and Crane would revise the script written by another writer, mainly if something concerning either the series or a character felt foreign. The hardest episodes to write were always "the first one and the last one of each season." Unlike other storylines, the idea for a relationship between Joey and Rachel was decided on halfway through the eighth season. The creators did not want Ross and Rachel to get back together so soon, and while looking for a romantic impediment, a writer suggested Joey's romantic interest in Rachel. The storyline was incorporated into the season; however, when the actors feared that the storyline would make their characters unlikable, the storyline was wrapped up, until it again resurfaced in the season's finale. For the ninth season, the writers were unsure about the amount of storyline to give to Rachel's baby, as they wanted the show neither to revolve around a baby nor pretend there to be none. Crane said that it took them a while to accept the idea of a tenth season, which they decided to do because they had enough stories left to tell to justify the season. Kauffman and Crane would not have signed on for an eleventh season, even if all the cast members had wanted to continue. The first season was shot on Stage 5 at Warner Bros. Studios in Burbank, California. NBC executives had worried that the coffee house setting was too hip and asked for the series to be set in a diner, but, eventually consented to the coffee house concept. The opening title sequence was filmed in a fountain at the Warner Bros. Ranch at 4:00 am, while it was particularly cold for a Burbank morning. At the beginning of the second season, production moved to the larger Stage 24, which was renamed "The Friends Stage" after the series finale. Filming for the series began during the summer of 1994 in front of a live audience, who were given a summary of the series to familiarize themselves with the six main characters; a hired comedian entertained the studio audience between takes. Each 22-minute episode took six hours to film—twice the length of most sitcom tapings—mainly due to the several retakes and rewrites of the script. —  David Schwimmer on the series finale. NBC heavily promoted the series finale, which was preceded by weeks of media hype. Local NBC affiliates organized viewing parties around the U.S., including an event at Universal CityWalk featuring a special broadcast of the finale on an outdoor Astrovision screen. The finale was the subject of two episodes of Dateline NBC, one of which ran for two hours. A one-hour retrospective of clips from previous episodes was shown before to the airing of the episode. Following the finale, The Tonight Show with Jay Leno was filmed on the set of the Friends' Central Perk coffee house, which featured the series's cast as guests. The advertising rates for the finale averaged $2 million for 30 seconds of commercial time, breaking the record held by the Seinfeld finale at $1.7 million. —  Robert Bianco of USA Today on the series finale. The Chicago Sun-Times' Ginny Holbert found Joey and Rachel's characteristics to be underdeveloped, while Richmond commended the cast as a "likeable, youth ensemble" with "good chemistry." Robert Bianco of USA Today was complimentary of Schwimmer, calling him "terrific." He also praised the female leads, but was concerned that Perry's role as Chandler was "undefined" and that LeBlanc was "relying too much on the same brain-dead stud routine that was already tired the last two times he tried it." The authors of Friends Like Us: The Unofficial Guide to Friends thought that the cast was "trying just a little too hard", in particular, Perry and Schwimmer. The table below shows the ratings of Friends in the United States, where it consistently ranked within the top ten of the final television season ratings. "Rank" refers to how well Friends rated compared to other television series that aired during primetime hours of the corresponding television season. It is shown in relation to the total number of series airing on the then-six major English-language networks in a given season. "Viewers" refers to the average number of viewers for all original episodes, broadcast during the television season in the series's regular timeslot. The "season premiere" is the date that the first episode of the season aired, and the "season finale" is the date that the final episode of the season aired. So far, Friends has been the last sitcom to reach the no. 1 spot on television, as its successors were CSI: Crime Scene Investigation, American Idol, NBC Sunday Night Football, and NCIS. Friends has aired on different channels in the UK in their original, unedited international versions prior to their being re-edited for US broadcast and syndication. These versions, with additional footage not seen domestically, have aired on such stations as Channel 4, Sky1, E4, and Comedy Central UK. On September 4, 2011, Friends officially ended on E4 after the channel re-ran the series since 2004. Comedy Central took over the rights to air the program from October 2011. Since 2018 Channel 5 started airing the program. In the Republic of Ireland, each season of the show made its European debut on RTÉ2. After 2004 RTÉ2 began to repeat the series from the start before moving over to TV3 and its digital channel 3e in 2010. As of February 2015[update], repeats of the show have returned to RTÉ2 while also broadcasting on Comedy Central Ireland. Series 10's finale, broadcast on May 28, 2004, was on Channel 4. It was broadcast from 9pm to 10pm and attracted Friends' largest UK audiences. It attracted almost 10 million viewers, and is currently standing at Number 10 in Channel 4's most-watched shows. Big Brother was moved to 10pm, which Friends had beaten. Friends got 9.6 million viewers at 9pm, while Big Brother 5's launch attracted 7.2 million viewers at 10pm, which is the most-watched premiere on UK TV ever. However, on January 3, 2007, Celebrity Big Brother 5's launch was watched by 7.3 million viewers, and its eviction on January 19, 2007 was watched by 8.7 million viewers. In Australia, The original released DVDs were released were fold out box sets which contained three discs and released as follows: Season 1 and Season 2 on March 13, 2002, Season 3 and Season 4 on July 9, 2002, Season 5, 6 and 7 on July 29, 2002, Season 8 on March 18, 2003, Season 9 on February 11, 2004 and Season 10 on November 24, 2004. Repackaged sets, slimmed into regular DVD cases also containing three discs were released from 2003 to 2004. Collector's Edition sets were released from September 9, 2003 through to February 1, 2006, these sets contains 4 discs, in fat DVD cases, with extra bonus material. On October 4, 2006, the individual seasons were repackaged into regular DVD case sets and marked as ''Including Brand New Bonus Disc". Once again each individual season were repackaged with new artwork on March 31, 2010. The first complete series boxset on DVD was released around 2004 or 2005, this was titled 'The One With All Ten Seasons" and the packaging was a black box with a lift up lid and contains exclusive packaging for all ten seasons. The second complete series boxset was released August 21, 2013 and was a red box which contained the 2010 individual season sets inside. On October 1, 2014 was the 20th Anniversary boxset, this was a white box and contained the same 2010 individual releases inside. On October 7, 2015, another boxset was released 'The One With All Ten Seasons", the same name used on the original boxset, however this time slimmed down and contains the 2010 individual releases inside. The outer box is open on insert side for the cases to slide in and out, more of a budget release. In 2016, a repackaged 'The Complete Series' Blu-Ray boxset was issued, contenting the same 10 individual season in the original set, however the box is more cut down and is opened on one side, and also does not include the book that contained the episode guide. ^ “Friends (1994).” Ice Pilots NWT (a Titles & Air Dates Guide), epguides.com/Friends/. ^ "'Friends' Was Originally Called 'Six of One'". Abcnews.go.com. April 5, 2012. Archived from the original on August 8, 2016. Retrieved August 3, 2016. ^ Matt Lauer (May 5, 2004). "'Friends' Creators Share Show's Beginnings". NBSnews.com. Archived from the original on October 2, 2013. Retrieved May 5, 2004. ^ a b Zach Seemayer (March 31, 2014). "The 10 Most-Watched TV Series Finales Ever!". Archived from the original on September 3, 2015. Retrieved May 23, 2015. ^ Stacy Conradt (February 28, 2015). "The 10 Most-Watched Series Finales Ever". Archived from the original on May 11, 2015. Retrieved May 24, 2015. ^ Natalie Kalin (April 29, 2015). "Top 10 Most Watched TV Finales Ever". HuffingtonPost.com. Archived from the original on May 25, 2015. Retrieved May 24, 2015. ^ "'Friends' Finale Is Decade's Most-Watched TV Show". Chicago Tribune. December 4, 2009. Archived from the original on August 12, 2012. Retrieved August 18, 2010. ^ "The Most Watched TV Episode of the Decade Was ... The Series Finale of 'Friends'". Daily News. New York. Archived from the original on December 7, 2009. Retrieved December 22, 2009. ^ a b "The 100 Best Tv Shows Of All-Time". Time. September 6, 2007. Archived from the original on February 26, 2009. ^ "Friends". Television Academy. Retrieved October 16, 2018. ^ a b "TV Guide Names Top 50 Shows". CBS News. April 26, 2002. Archived from the original on September 4, 2012. ^ a b "Empire Magazine's 50 Greatest TV Shows of All Time list". Listal.com. December 23, 2008. Archived from the original on July 13, 2011. Retrieved April 2, 2011. ^ "The 50 Greatest TV Shows of All Time". empireonline.com. December 23, 2008. Archived from the original on November 5, 2011. Retrieved April 2, 2011. ^ "101 Best Written TV Series List". Archived from the original on January 10, 2014. ^ Fretts, Bruce; Roush, Matt. "The Greatest Shows on Earth". TV Guide. Vol. 61 no. 3194–3195. pp. 16–19. ^ Lomartire, Paul (September 4, 1994). "Fall TV '94". The Palm Beach Post. Retrieved February 14, 2009. ^ Bianco, Robert (March 3, 2004). "Friends played great game of poker". USA Today. Retrieved February 20, 2009. ^ Booth, Jenny (May 21, 2006). "Sarey Carey: Does pride in housework make me bad as well as mad?". The Sunday Times. London. Archived from the original on June 29, 2011. Retrieved February 20, 2009. ^ a b c d e f g Jicha, Tom (May 2, 2004). "They leave as they began: With a buzz". The Baltimore Sun. p. 1. Archived from the original on June 4, 2011. Retrieved December 23, 2008. ^ "Matt LeBlanc – Friends Interview". NBC. Archived from the original on May 11, 2016. ^ McLellan, Dennis (February 12, 2008). "Married .. With Children Co-Creator Dies". The Baltimore Sun. Archived from the original on June 4, 2011. Retrieved December 23, 2008. ^ "Friends Star Finally has Chance to Enjoy Success". Los Angeles Times. March 26, 1995. Retrieved February 20, 2009. ^ a b Lowry, Brian (August 12, 1996). "Friends cast returning amid contract dispute". Los Angeles Times. Los Angeles. ISSN 0458-3035. OCLC 3638237. Retrieved March 8, 2009. ^ Carter, Bill (July 16, 1996). "Friends Cast Bands Together To Demand a Salary Increase". The New York Times. ISSN 0362-4331. OCLC 1645522. Retrieved March 7, 2018. ^ Rice, Lynette (April 21, 2000). "Friendly Fire". Entertainment Weekly. p. 1. Archived from the original on July 19, 2009. Retrieved March 8, 2009. ^ Guinness World Records 2005 (Special 50th anniversary ed.). New York City: Guinness World Records Ltd. 2004. p. 288. ISBN 978-1892051226. OCLC 56213857. ^ Saah, Nadia (January 21, 2004). "Friends til the end". USA Today. ISSN 0734-7456. Retrieved December 19, 2008. ^ Rice, Lynette (April 21, 2000). "Friendly Fire". Entertainment Weekly. p. 2. ISSN 1049-0434. OCLC 21114137. Archived from the original on July 20, 2009. Retrieved March 7, 2018. ^ Carter, Bill (February 12, 2002). "'Friends' Deal Will Pay Each Of Its 6 Stars $22 Million". New York Times. Archived from the original on March 8, 2013. Retrieved March 28, 2012. ^ a b Jicha, Tom (May 2, 2004). "They leave as they began: With a buzz". The Baltimore Sun. p. 2. Archived from the original on June 4, 2011. Retrieved December 23, 2008. ^ a b c d McCarroll, Christina (May 6, 2004). "A family sitcom for Gen X - Friends cast a new TV mold". The Christian Science Monitor. Archived from the original on January 31, 2009. Retrieved December 19, 2008. ^ a b Bianco, Robert (January 1, 2005). "The Emmy Awards: Robert Bianco". USA Today. Retrieved December 19, 2008. ^ a b c Kiesewetter, John (January 27, 2002). "Friends grows in stature, ratings". The National Enquirer. Retrieved January 5, 2009. ^ Zaslow, Jeffrey (October 8, 2000). "Balancing friends and family". USA Weekend. Archived from the original on May 26, 2012. Retrieved December 19, 2008. ^ Power, Ed (May 6, 2004). "Why we will miss our absent Friends". Irish Independent. Retrieved December 19, 2008. ^ "People: DeGeneres tries to calm the howling pack". The Denver Post. October 18, 2007. Archived from the original on July 19, 2009. Retrieved December 19, 2008. ^ Wild, David (2004). Friends 'Til the End: The Official Celebration of All Ten Years (Authorized collector's ed.). New York City: Time Warner. ISBN 978-1932273199. OCLC 55124193. ^ Brooks, Tim; Marsh, Earle (2007). The Complete Directory to Prime Time Network and Cable TV Shows 1946-Present (Ninth Edition). Ballantine Books. p. 1694=1697. ISBN 978-0-345-49773-4. ^ a b c d e f g h i j k l m n Lauer, Matt (May 5, 2004). "Friends creators share show's beginnings". MSNBC. Archived from the original on December 28, 2013. Retrieved May 4, 2005. ^ a b Kolbert, Elizabeth (March 8, 1994). "Birth of a TV Show: A Drama All Its Own" Archived January 22, 2009, at the Wayback Machine. The New York Times. Retrieved on January 19, 2008. ^ "Behind the Scenes". TV2. Archived from the original on February 3, 2009. Retrieved January 10, 2009. ^ Stallings, Penny (2000). The Ultimate Friends Companion. London: Channel 4 Books. pp. 102–103. ISBN 0-7522-7231-4. ^ a b Kolbert, Elizabeth (May 9, 1994). "The Conception and Delivery of a Sitcom: Everyone's a Critic". New York Times. Archived from the original on January 22, 2009. Retrieved December 30, 2008. ^ a b c d e f g h i "Friends: Kevin Bright". USA Today. April 23, 2004. Archived from the original on July 15, 2013. Retrieved December 28, 2008. ^ Kolbert, Elizabeth (April 6, 1994). "Finding the Absolutely Perfect Actor: The High-Stress Business of Casting Archived October 8, 2016, at the Wayback Machine", The New York Times. Retrieved on January 19, 2008. ^ Couric, Katie (May 5, 2004). "Can David Schwimmer leave Ross Geller behind?". MSNBC. Archived from the original on November 3, 2012. Retrieved December 23, 2008. ^ a b c Holston, Noel. "Friends that were like family". Newsday. Archived from the original on January 24, 2009. Retrieved January 1, 2009. ^ a b Kolbert, Elizabeth (May 23, 1994). "A Sitcom is Born: Only Time Will Tell the Road to Prime Time". New York Times. Archived from the original on January 22, 2009. Retrieved January 1, 2009. ^ Shayne, Bob (June 10, 2001). "No Experience Wanted". Los Angeles Times. Archived from the original on June 16, 2009. Retrieved January 4, 2009. ^ a b Bauder, David (May 15, 2002). "Baby episode could make Friends TV's top show". Seattle Times. Archived from the original on January 22, 2009. Retrieved January 3, 2009. ^ Radloff, Jessica. "The Creators of Friends Reveal Brand-New Secrets About the Show". Glamour. Retrieved December 3, 2018. ^ "Have yourself a mocha latte and reminisce a bit". Ocala.com. May 5, 2004. Archived from the original on February 11, 2018. Retrieved February 11, 2018. ^ Endrst, James (February 23, 1995). "Friends wins friends with caffeine-fueled energy". Austin American-Statesman. Retrieved January 3, 2009. ^ Pollak, Michael (November 27, 2005). "F. Y. I.". New York Times. ^ "52 millon friends see off Friends". China Daily. May 8, 2004. Archived from the original on January 25, 2009. Retrieved December 31, 2008. ^ a b c d Ryan, Suzanne C. (December 7, 2006). "Friendly art of funny". The Age. Melbourne, Australia. Archived from the original on August 25, 2009. Retrieved December 30, 2008. ^ Gilbert, Matthew (January 15, 2004). "Friends end painful, cast says". Boston Globe. Archived from the original on January 21, 2009. Retrieved January 5, 2009. ^ a b c Hartlaub, Peter (January 15, 2004). "Friends challenge - finding right words to say goodbye". San Francisco Chronicle. Archived from the original on January 23, 2009. Retrieved December 28, 2008. ^ a b Shales, Tom (May 7, 2004). "A Big Hug Goodbye to Friends and Maybe to the Sitcom". Washington Post. Retrieved December 28, 2008. ^ a b c "Friends heads for much-hyped farewell". The Indian Express. May 5, 2004. Archived from the original on January 29, 2009. Retrieved December 19, 2008. ^ a b c "Estimated 51.1M Tune in for Friends Finale". Fox News Channel. May 7, 2004. Archived from the original on December 17, 2008. Retrieved December 28, 2008. ^ Oldenburg, Ann (May 5, 2004). "And now, the one where Friends says goodbye". USA Today. Retrieved December 28, 2008. ^ "Friends timeline". The Hollywood Reporter. May 6, 2004. Archived from the original on January 14, 2009. Retrieved February 19, 2009. ^ a b Bianco, Robert (May 7, 2004). "Rachel stays, so Friends are able to leave together". USA Today. Retrieved January 1, 2009. ^ "Friends Season 1". CBS Interactive Inc. Archived from the original on May 16, 2014. Retrieved March 29, 2014. ^ Feran, Tom (September 22, 1994). "New Series Softens Dabney Coleman—A Little", The Plain Dealer, Newhouse Newspapers. Retrieved on January 4, 2009. ^ Hodges, Ann (September 22, 1994). "NBC sitcoms make Thursday less funny Archived February 26, 2013, at the Wayback Machine", Houston Chronicle, Hearst Newspapers. Retrieved on January 4, 2009. ^ a b Richmond, Ray (September 22, 1994). "Season Premiere of Friends Leaves Room to Grow", (Registration required). Los Angeles Daily News, Los Angeles Newspaper Group. Retrieved on January 4, 2009. ^ Rosenberg, Howard (September 22, 1994). "NBC's Strongest Evening of the Week Has Its Weak Spot Archived April 2, 2015, at the Wayback Machine", The Los Angeles Times, Tribune Company. Retrieved on January 4, 2009. ^ Holbert, Ginny (September 22, 1994). "X Marks Spot For Friends On Thursday." (Registration required). Chicago Sun-Times. Retrieved on January 4, 2009. ^ Bianco, Robert (September 22, 1994). "Six Friends Sittin' Around, Talking", Pittsburgh Post-Gazette. ^ a b "Friends climax watched by 51m". BBC News. May 7, 2004. Archived from the original on February 5, 2009. Retrieved January 1, 2009. ^ a b Havrilesky, Heather (May 7, 2004). "Never forget your Friends". Salon.com. Archived from the original on January 22, 2009. Retrieved January 1, 2009. ^ a b c d Carter, Bill (February 18, 2002). "Plot Twists Paid Off For Friends". The New York Times. Archived from the original on November 18, 2007. Retrieved November 13, 2007. ^ a b Bonin, Liane (January 9, 2003). "Is Friends overstaying its welcome?". CNN. Archived from the original on January 22, 2009. Retrieved January 1, 2008. ^ "Friends - The 100 Best TV Shows of All". Time. August 13, 2007. Archived from the original on April 30, 2009. Retrieved April 27, 2009. ^ Rodman, Sarah (May 7, 2004). "Six pals depart on a classy note". Boston Herald. p. 3. ^ Catlin, Roger (May 7, 2004). "The Long Farewell is Over; Lots of Fans, Little Fanfare for Mich-Anticipated Finale of Friends". Hartford Courant. Retrieved January 1, 2009. ^ Perkins, Ken Parish (May 7, 2004). "Farewell to Friends: The finale to the 10-year series wraps up all the loose ends". Fort Worth Star-Telegram. Retrieved March 7, 2018. ^ Lowry, Brian (July 19, 2002). "Its Coffin Overflows". Orlando Sentinel. Archived from the original on January 22, 2009. Retrieved December 19, 2008. ^ Friends Archived October 10, 2011, at the Wayback Machine emmys.com. Retrieved June 1, 2014. ^ "Advanced Primetime Awards Search". Academy of Television Arts & Sciences. Archived from the original on January 21, 2009. Retrieved January 5, 2009. Type "Friends" in the "Program" field, select "1993" and "2008" in "Year range" field, and select "NBC" in "Network" field. ^ Keck, William (June 2, 2005). "Kudrow back in the fold". USA Today. Retrieved January 5, 2009. ^ "15 years of recognition". TelevisionWeek. April 25, 2005. Archived from the original on January 22, 2009. Retrieved January 5, 2009. 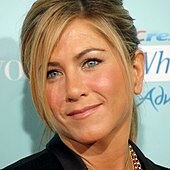 ^ "HPFA - Jennifer Aniston". Golden Globe Award. Archived from the original on January 21, 2009. Retrieved January 5, 2009. ^ "Entertainment Awards Database". Los Angeles Times. pp. 2–3. Retrieved January 5, 2009. ^ "Tim Allen Wins Twice at Awards". Rocky Mountain News. March 6, 1995. Retrieved January 5, 2009. ^ "2001 5th Annual Satellite Awards". Satellite Awards. Archived from the original on December 18, 2008. Retrieved January 5, 2009. Select the "Television" field. ^ "The 2nd Annual Screen Actors Guild Awards". Screen Actors Guild Awards. February 24, 1996. Archived from the original on May 25, 2013. Retrieved July 10, 2013. ^ a b c d e f g h "You Won't Believe What America's Favorite "Friends" Episodes Are". Archived from the original on June 20, 2015. Retrieved August 12, 2015. ^ "Nielsen Ratings (December 1996–January 1997)" (PDF). Archived (PDF) from the original on March 3, 2016. Retrieved August 12, 2015. ^ "You'll never believe how much money the 'Friends' cast STILL earns today". USA TODAY. Retrieved April 5, 2018. ^ Anne, S. (December 27, 2004). "Take it easy yaar!". The Hindu. Chennai, India. Retrieved January 4, 2009. ^ Crook, John (May 2, 2004). "Going 'Friends'-less / Long-running show drops the curtain". Toledo Blade. Zap2It. pp. V3. Retrieved October 15, 2012. ^ a b Littlefield, Kinney (February 7, 1996). "'Murder, She Wrote' parodies 'Friends'". Pittsburgh Post-Gazette. Retrieved October 29, 2009. ^ Kalsi, Jyoti (May 8, 2006). "Where Friends hang out". Gulf News. Archived from the original on July 8, 2008. Retrieved December 30, 2008. ^ Ellen DeGeneres (host) (October 16, 2008). "The Ellen DeGeneres Show: Lisa Kudrow/Natasha Bedingfield/Jalen Testerman". The Ellen DeGeneres Show. Season 6. Episode 29. NBC. ^ Thorley, Chantelle (September 15, 2009). "London to celebrate 15 years of Friends with Central Perk pop-up". Event. Haymarket Media. Archived from the original on April 10, 2010. Retrieved September 22, 2009. ^ Hong, Haolan and Jo Ling Kent. "'Friends' in China: 'Central Perk' hits Beijing Archived March 4, 2016, at the Wayback Machine." CNN. July 2, 2010. Retrieved on July 4, 2010. ^ Tiwari, Shwali (September 27, 2016). "India Now Has 5 F.R.I.E.N.D.S Themed Cafes, But There's A Catch". India Times. Archived from the original on February 11, 2017. Retrieved February 11, 2017. ^ "A real-life version of Central Perk from F.R.I.E.N.D.S in Peshawar". The Good Times – Unique Pakistan. Archived from the original on December 12, 2015. ^ Quek, Eunice (November 28, 2016). "F.R.I.E.N.D.S-themed cafe Central Perk opens for business". AsiaOne. ^ Singson, Ysa (December 1, 2016). "Central Perk, The Cafe From 'Friends,' Just Opened In Singapore". Cosmopolitan Philippines. ^ Katzman, David M. (Summer 1998). "TV and American Culture". American Studies. 2. 39: 5–12. ^ DellaContrada, John (April 16, 2004). ""Friends" Reflected Change in American Society, Among First TV Shows to Portray "Youth on Their Own," says UB Pop-Culture Expert". Buffalo News. Archived from the original on May 28, 2012. ^ VanDerWerff, Todd (January 13, 2016). "Friends was a great show — that just happened to ruin TV comedy". Retrieved August 2, 2018. ^ Pickard, Anna (September 9, 2009). "How I met Neil Patrick Harris". The Guardian. Retrieved June 16, 2018. ^ Martin, Daniel (September 19, 2016). "The Big Bang Theory: show returns for 10th season, but is it time it went bust?". Retrieved August 2, 2018. ^ Lyons, Margaret. "Happy Endings: Wait, Which Friends Clone Is That Again?". Nymag.com. Retrieved August 4, 2012. ^ "Is 'Seinfeld' The Greatest Sitcom Ever?". Deadline Hollywood. December 3, 2012. Archived from the original on October 2, 2013. Retrieved September 30, 2013. ^ "As 100 Melhores Séries da História, segundo jornalistas brasileiros!" (in Portuguese). Ligado em Série. October 28, 2014. Archived from the original on October 31, 2014. Retrieved November 1, 2014. ^ Welsh, James (January 15, 2004). "NBC elaborates on Friends finale plans". Digital Spy. Archived from the original on January 21, 2009. Retrieved December 31, 2008. ^ a b Carter, Bill (December 21, 2002). "NBC Close to a Deal to Keep Friends for Another Season". New York Times. Archived from the original on January 22, 2009. Retrieved December 29, 2008. ^ Dempsey, John (July 11, 2005). "Friends of Friends". Variety. Archived from the original on January 19, 2012. Retrieved September 3, 2009. ^ Albiniak, Paige (March 5, 2012). "With Friends Like These, Who Needs Standard-Def?". Broadcasting & Cable. Archived from the original on February 26, 2013. ^ "The One With the High Definition". ScreenScribe. January 17, 2011. Archived from the original on July 26, 2013. Retrieved July 10, 2013. ^ "Ross and Phoebe "quitting Friends"". BBC News. December 23, 1999. Archived from the original on February 6, 2009. Retrieved January 1, 2009. ^ "Channel 4's £100m Friends deal". BBC News. December 16, 1999. Archived from the original on May 22, 2009. Retrieved January 1, 2009. ^ "Channel 4 to stop showing Friends after 15 years". The Daily Telegraph. London. February 10, 2010. Archived from the original on February 13, 2010. Retrieved May 3, 2010. ^ "Friends finale draws record 8.6m". BBC News. May 29, 2004. Retrieved January 1, 2009. ^ "Same time, different channel". Comedy Central. September 2, 2011. Archived from the original on September 25, 2011. Retrieved September 4, 2011. ^ "European debut of Friends finale on RTÉ". Raidió Teilifís Éireann. May 11, 2004. Archived from the original on December 18, 2008. Retrieved January 1, 2009. ^ "TV – Friends – entertainment.ie". entertainment.ie. Archived from the original on May 18, 2015. ^ Warneke, Ross (November 18, 2004). "Rewind". The Age. Melbourne, Australia. Archived from the original on February 15, 2009. Retrieved January 1, 2009. ^ "Channel Ten seriously in trouble at 7 pm timeslot". news.com.au. The Daily Telegraph (Sydney). November 7, 2008. Archived from the original on June 25, 2013. Retrieved April 6, 2012. ^ "Friends". TV2. Archived from the original on February 4, 2009. Retrieved January 1, 2009. ^ Global Television Network – Friends Bumper version 1. YouTube. November 29, 2009. Archived from the original on May 23, 2015. Retrieved April 12, 2015. ^ "Friends". slice.ca. Archived from the original on April 2, 2015. Retrieved April 12, 2015. ^ Choudhary, Vidhi (July 11, 2016). "Friends most watched English show on Indian TV in January–June". Live Mint. New Delhi: HT Media Ltd. Retrieved January 24, 2018. ^ "Κωμωδία | Τα Φιλαρακια (Friends) | Star Tv". Star Channel. Retrieved February 18, 2018. ^ "Friends - Τα Φιλαρακια". TVOne. Retrieved February 18, 2018. ^ Lieberman, David (October 15, 2014). "'Friends' Licensed To Netflix In Warner Bros Deal — VIDEO". Deadline Hollywood. Retrieved December 24, 2017. ^ Raftery, Liz (October 15, 2014). "Friends Is Coming to Netflix!". TV Guide. tvguide.com. CBS Interactive. Archived from the original on October 18, 2014. Retrieved October 15, 2014. ^ Heyman, Jessie (May 1, 2015). "Seinfeld vs. Friends: Breaking Down the Economics of Two Beloved '90s Sitcoms". Vogue. Retrieved December 24, 2017. ^ Welch, Chris (January 1, 2015). "Every episode of Friends is now on Netflix". The Verge. Retrieved December 24, 2017. ^ Dretzka, Gary (November 2, 1995). "Hit Show, Hit Soundtrack: It's No Longer An Accident". Chicago Tribune. Archived from the original on August 23, 2009. Retrieved January 3, 2009. ^ Burlingame, Jon (December 27, 1995). "Friends Theme Leads Pack of Hot-Selling TV Soundtracks". The Hollywood Reporter. Retrieved January 3, 2009. ^ "Friends Again: Various Artists". Amazon.com. Retrieved January 3, 2009. ^ "Friends: The One With All the Trivia". Amazon.com. Retrieved January 3, 2009. ^ "Friends: The One With All the Trivia". Amazon.com. Retrieved October 8, 2009. ^ "Friends – Season 1–10 Complete Collection 15th Anniversary DVD: Amazon.co.uk: Jennifer Aniston, Courteney Cox, Lisa Kudrow, Matt LeBlanc, Matthew Perry, David Schwimmer, James Michael Tyler, Elliott Gould, Maggie Wheeler, Christina Pickles, Paul Rudd, Jane Sibbett, David Crane, Marta Kauffman: DVD". Amazon.co.uk. Retrieved July 26, 2010. ^ TVShowsonDVD.com (June 19, 2012). "Friends – Warner Home Video Press Release Announces The Complete Series on Blu-ray Disc!". Archived from the original on June 22, 2012. Retrieved June 19, 2012. ^ a b c d e Fisher, Nick (May 27, 2000). "Videos to buy". The Sun. News Group Newspapers. p. 47. ^ "Friends (Season 1) (4 DVD Set)". JB Hi-Fi. Archived from the original on January 20, 2009. Retrieved January 4, 2009. ^ "Friends - The Complete Second Season". Amazon.com. Retrieved January 3, 2009. ^ "Friends (Season 2) (4 DVD Set)". JB Hi-Fi. Archived from the original on January 20, 2009. Retrieved January 4, 2009. ^ "Friends - The Complete Third Season". Amazon.com. Retrieved January 3, 2009. ^ "Friends (Season 3) (4 DVD Set)". JB Hi-Fi. Archived from the original on January 20, 2009. Retrieved January 4, 2009. ^ "Friends - The Complete Fourth Season". Amazon.com. Retrieved January 3, 2009. ^ "Friends (Season 4) (4 DVD Set)". JB Hi-Fi. Archived from the original on January 20, 2009. Retrieved January 4, 2009. ^ "Friends - The Complete Fifth Season". Amazon.com. Retrieved January 3, 2009. ^ "Friends (Season 5) (4 DVD Set)". JB Hi-Fi. Archived from the original on January 20, 2009. Retrieved January 4, 2009. ^ "Friends - The Complete Sixth Season". Amazon.com. Retrieved January 3, 2009. ^ Fisher, Nick (July 15, 2000). "Video view". The Sun. News Group Newspapers. p. 40. ^ "Friends (Season 6) (4 DVD Set)". JB Hi-Fi. Archived from the original on January 20, 2009. Retrieved January 4, 2009. ^ "Friends - The Complete Seventh Season". Amazon.com. Retrieved January 3, 2009. ^ "Friends: Complete Season 7 - New Edition ". Amazon.com. Retrieved January 4, 2009. ^ "Friends (Season 7) (4 DVD Set)". JB Hi-Fi. Archived from the original on January 20, 2009. Retrieved January 4, 2009. ^ "Friends - The Complete Eighth Season". Amazon.com. Retrieved January 3, 2009. ^ "Friends: Complete Season 8 - New Edition ". Amazon.com. Retrieved January 4, 2009. ^ "Friends (Season 8) (4 DVD Set)". JB Hi-Fi. Archived from the original on January 20, 2009. Retrieved January 4, 2009. ^ "Friends - The Complete Ninth Season". Amazon.com. Retrieved January 3, 2009. ^ "Friends: Complete Season 9 - New Edition ". Amazon.com. Retrieved January 4, 2009. ^ "Friends (Season 9) (4 DVD Set)". JB Hi-Fi. Archived from the original on January 20, 2009. Retrieved January 4, 2009. ^ "Friends - The One with All Ten Seasons (Limited Edition)". Amazon.com. Retrieved January 3, 2009. ^ "Friends: Complete Season 10 - New Edition ". Amazon.com. Retrieved January 4, 2009. ^ "Friends (Season 10) (4 DVD Set)". JB Hi-Fi. Archived from the original on January 20, 2009. Retrieved January 4, 2009. ^ Endrst, James (September 5, 2004). "Matt LeBlanc's Joey goes West to seek fame & fortune". Daily News. Archived from the original on January 12, 2012. Retrieved January 4, 2009. ^ Levin, Gary (July 24, 2003). "NBC has sitcom plans for Friends pal Joey". USA Today. Retrieved December 30, 2008. ^ "Joey finds new friends on NBC". CNN. September 10, 2004. Archived from the original on January 22, 2009. Retrieved January 4, 2009. ^ Weintraub, Joanne (July 11, 2004). "Joey co-star looking for sitcom laughs". Milwaukee Journal Sentinel. Archived from the original on February 9, 2006. Retrieved January 4, 2009. ^ Moraes, Lisa de (September 11, 2004). "Joey & The Apprentice: Downright Unfriendly". Washington Post. Retrieved December 30, 2008. ^ "Weekly Program Rankings". ABC Medianet. March 21, 2006. Archived from the original on January 20, 2009. Retrieved December 30, 2008. ^ Bauder, David (May 15, 2006). "NBC Betting on Aaron Sorkin's New Drama". Washington Post. Retrieved December 30, 2008. Littlefield, Warren (May 2012). "With Friends Like These". Vanity Fair. Archived from the original on April 22, 2019. Retrieved April 22, 2019. An oral history. Allen, Samantha (September 12, 2014). "The Best Reason to Love 'Friends' Is the One We Never Realized at the Time". United States: Mic. Ihnat, Gwen (August 18, 2014). "How 'Friends' Changed the Sitcom Landscape". The A.V. Club. United States. Harrison, Andrew (12 September 2014). "The Hunting of the Snark: Friends, 20 Years On". New Statesman. United Kingdom.